Yup, that’s totally how it looks on me too. It has fast become a wardrobe MVP (most valuable player – mum gets upset when I talk in abbreviations she doesn’t understand). 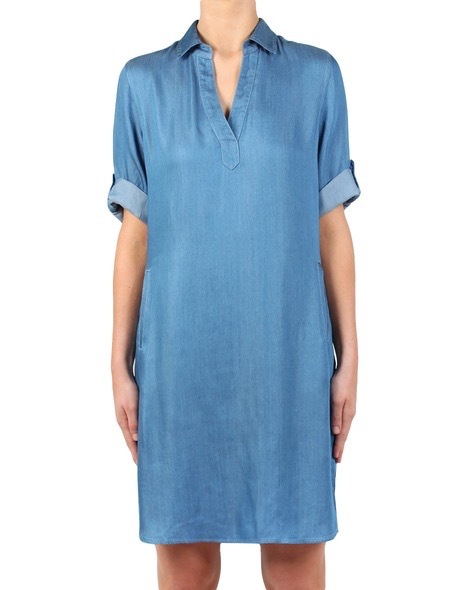 But despite the fact that the me above has rolled her sleeves, it is quite a heavy cotton and not ideal for summer. The other day I was walking through David Jones and I saw something similar. I couldn’t stop to shop, so I clocked that it was Trenery, and kept walking. 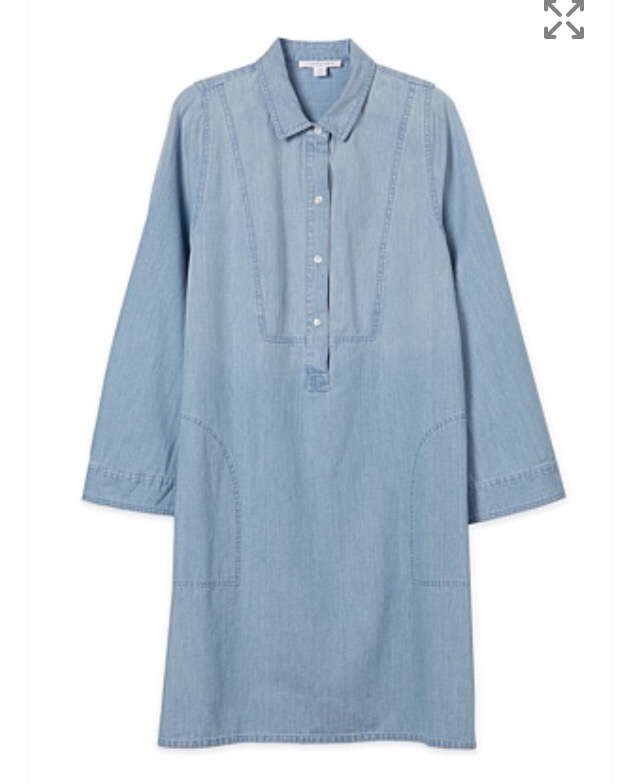 I kept thinking about the dress (which is always a surefire way to know that it’s a worthwhile buy), but I was held back by the thought that every girl I knew would probably buy the same one. 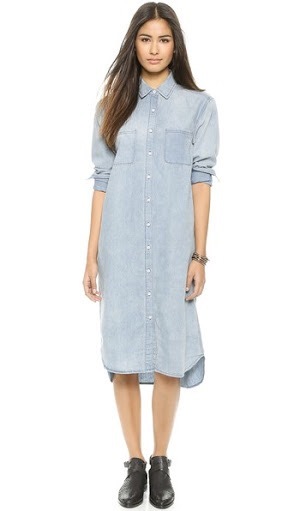 Because we would all recognise the value in such a dress. And wouldn’t we all look ridiculous come school pick up, rocking up to school to fetch our uniformed children, wearing, well, a uniform. 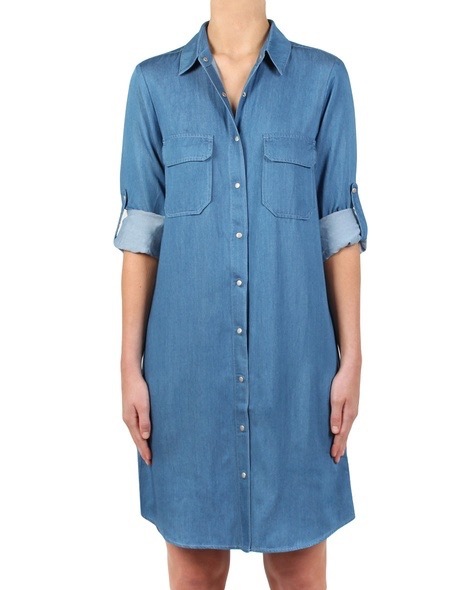 A uniform of chambray dresses. But still I kept thinking of the dress. And then a strange thing happened. 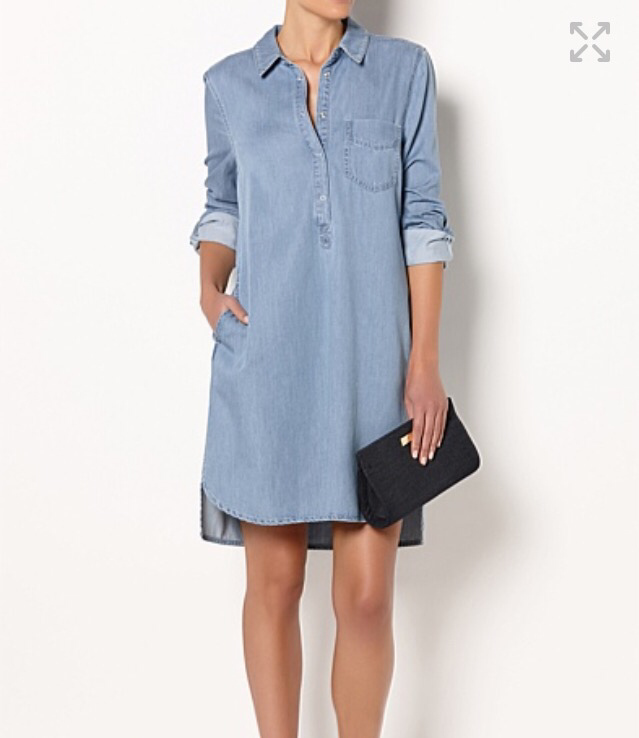 Chambray dresses started popping up EVERYWHERE. And I mean everywhere. *exact words may differ slightly from those used in actual Witchery email. So there we have it. And there are probably more versions landing in shops as we type / read. Clearly a bid to take over the world. Or at the very least my wardrobe. How to choose? How to choose? I’ll throw it open to you. 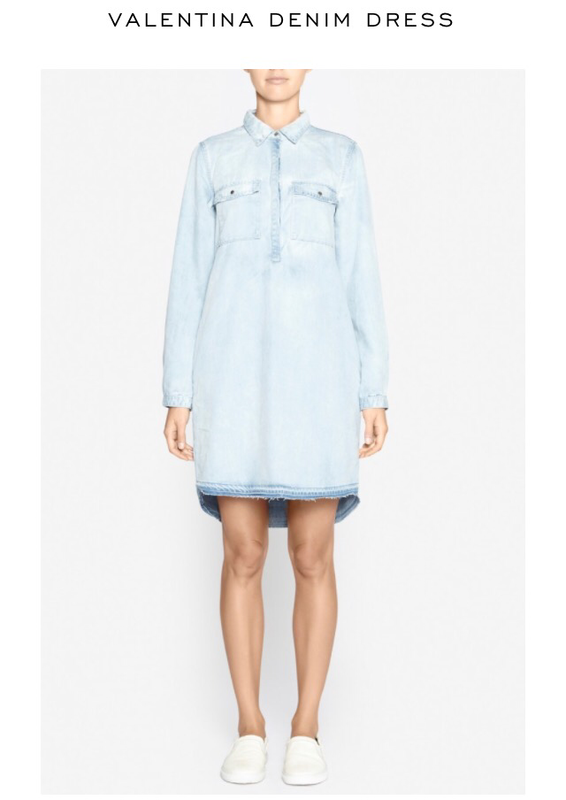 Vote 1) for Trenery ($149, though spend and save likely, possibly a bit short – ugly knees – and pockets could be unflattering?). Vote 2) for Camilla & Marc ($280, mind, and least likely to have a shop wise discount at any stage). Vote 3) for Picnic’s Paige ($129.95 – and possibly MOS-G should pay because she emailed me the picture of the Hobb’s boots, which I then had to buy, which is why I think I’m now being emailed by Picnic). Vote 4) for Picnic’s Nate ($139.95 – I guess the buttons cost $10, or maybe you’re paying for the name Nate, which I prefer to Paige). Vote 5) for Witchery ($149.95 but I have my birthday voucher and it says “low in stock” which always brings out the “buyer frenzy” in me). Vote 6) none of the above (Working Boy – stop hacking my blog). I’ll leave the decision to the crowd. It’s been a busy year so far. A really, particularly busy year. For many reasons and no reasons and I can’t say I’ve really achieved anything more than I have in less busy years. But nonetheless the fact remains that I have not found time to write. More importantly I have not found enough time to read. I only realised this yesterday, when Working Boy took the four boys to synagogue and I sat down to read for an hour. Vogue, if you must know. And all at once the urge to write overcame me. Ideas starting flowing in. My (deserted) blog began writing itself in my mind, as I relaxed and read. It reminded me of something author Caitlin Moran said, in an article I read in Elle magazine many months ago. Put simply, she said that writing was a simple equation – words in equal words out. The more words you drink in, the more you’ll have to output. I think she’s right. The less I read, the less I write, and I don’t think it’s just a matter of time. I may need to read to fuel my brain to write, but I also need to fuel my stomach. Unfortunately today is one of two 25 hour fasts in the Jewish calendar, so I am unfuelled. More specifically uncaffeinated. So the blog will have to resume tomorrow. Today’s fast ends a 3 week mourning period in the Jewish calendar. It is not a time for shopping and new things (though there are exceptions to the rule). So there’s only one thing I am buying today. And that is bread. More specifically Holy Seeds bread. 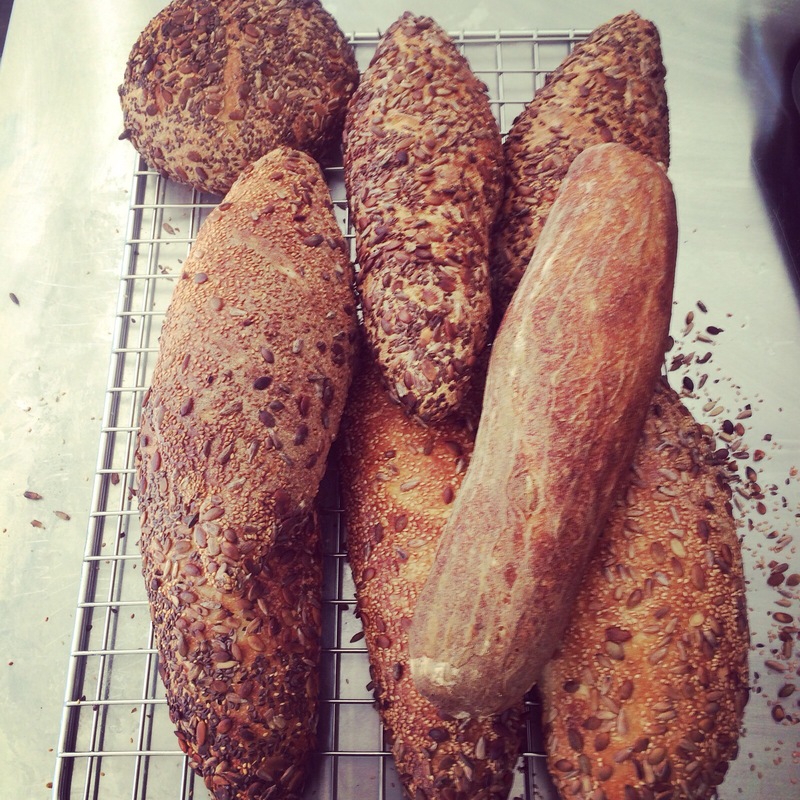 My goddess of a friend, Romy, is spending her fast baking artisan sourdough with her 4 children, so that others may purchase it and break their fast on it. (You can drool over her amazing food on her Instagram @holy_seeds). This is what I will break my fast on….smeared with avo, sprinkled with chilli flakes.